Don't see what you're looking for...just ask! We understand each home is unique and we will work with you to address your needs. Our standard package assumes the following guidelines. Gutters assume 1 level of gutters, full access and a home of 3500 sq feet or less. 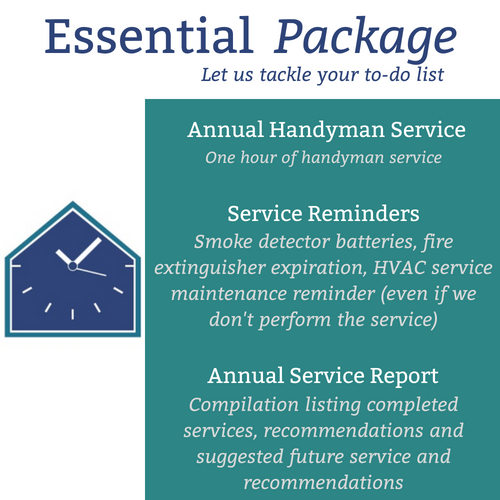 HVAC service assumes one furnace and one AC unit. Annual sewage cleaning assumes 100 feet of line. If additional issues arise we will notify your of the additional charge before work is complete. Annual sewage cleaning or HVAC services can be exchanged for 3 handyman hours. Exterior Window cleaning assumes 25 window panes and clear access to the outside windows. If any additional charges are required because the home is outside the standard package pricing, YHC will work with you and our vendors to obtain a competitive price.